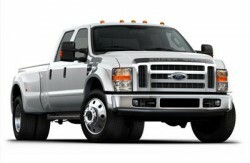 BAF can deliver the Ford F450/550 for dedicated CNG operation. BAF Technologies, Inc., Clean Energy Fuels Corp. subsidiary, has been officially designated by the Ford Motor Company as a Ford Qualified Vehicle Modifier (QVM) for gaseous-fueled vehicles. BAF’s alternative fuel vehicle upfitting capabilities include aftermarket compressed natural gas (CNG) conversions of Ford-manufactured vans, cutaway shuttles, taxis, pick-ups and light-duty trucks. To ensure that modified Ford vehicles meet strict vehicle warranty and QVM standards, the authorization program focuses on the aftermarket vendor’s design, manufacturing and quality control processes. In-depth evaluations by Ford include crash testing, demonstrated commitment to continuous quality improvement, and reviews of representative vehicles and customer support systems. BAF Technologies provides natural gas vehicle systems and conversions in the United States and supports clients with alternative fuel systems. Founded in 1992 and headquartered in Dallas, Texas, BAF was acquired by Clean Energy in October 2009. Item compiled using information from a Clean Energy Fuels press release.